It’s time to put away the water skis, reel in the fishing poles, and dry off the life jackets as another boating season winds to a close. It’s also time to prepare your boat for winter storage. When spring arrives next year, you don’t want to spend time scrubbing mildew and fixing the engine – you’d rather be all set to get back on the boat! Looking for tips? Curious as to where to start? 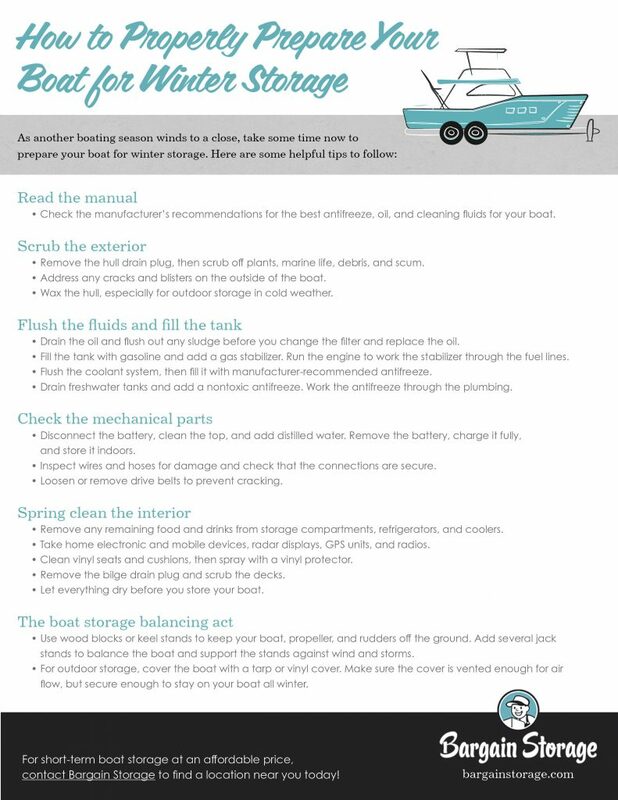 Here are some helpful tips to follow when storing your boat during the winter. Our tips will get you started, but you want to make sure to use the antifreeze, oil, and cleaning fluids that are best for your boat. If you can’t track down the manual, search for it online using the make and model of your boat and the term “owner’s manual.” The online search results should lead you to the document you need. Remove the hull drain plug, and then get to work scrubbing off plants, marine life or debris. As you clean, inspect the outside of your boat for cracks and blisters, and address them. Next, wax the hull. This is especially important if you’re storing the boat outside during the cold winter months. Drain the oil. This is easier to do when the engine is warm. Flush out any sludge before you change the filter and replace the oil − per manufacturer instructions − being careful not to overfill it. Fill the tank with gasoline and add a gas stabilizer for short-term storage. Run the engine to make sure the stabilizer works its way through the fuel lines. Flush your coolant system, then fill it with manufacturer-recommended antifreeze. If your boat has freshwater tanks and a water heater, drain them and add nontoxic antifreeze. Work the antifreeze through the sump pump, bilge pump, air conditioning pump, and anything else that requires plumbing. Disconnect the battery and top it with distilled water. Clean off any corrosion, charge it fully, and store it indoors. Inspect any parts that move, such as wires and hoses. Look for damage and make sure all of the connections are secure. Loosen or remove drive belts to prevent cracking over cold winter months. Check all boat storage compartments, refrigerators, and coolers for leftover food and drinks. Take them home or toss them out. Remove electronic and mobile devices as well as radar displays, GPS units, and radios. Store these gadgets indoors to protect them from the winter cold. Clean vinyl seats and cushions, then spray with a vinyl protector. Remove the bilge drain plug and scrub the decks. Let everything dry before you put your boat into short-term storage. Keep your boat off the ground during winter storage. Use wood blocks or keel stands to support the keel, paying careful attention to the load-bearing areas. Make sure the boat is up high enough to keep propellers and rudders off the ground. Add several jack stands to balance the boat, and make sure those stands are supported against wind and storms. If you opt for outdoor storage, cover the boat with a tarp or vinyl cover for protection from the elements. Make sure the cover is vented enough for air flow, but secure enough to stay on your boat all winter. 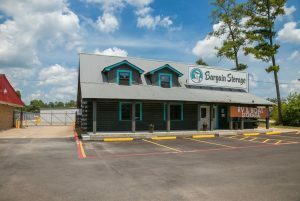 For short-term storage at an affordable price, consider Bargain Storage. We offer large vehicle parking spaces as well as individual storage units for your boat. With surveillance cameras and our friendly on-site staff, you will feel confident your boat is in the right place.